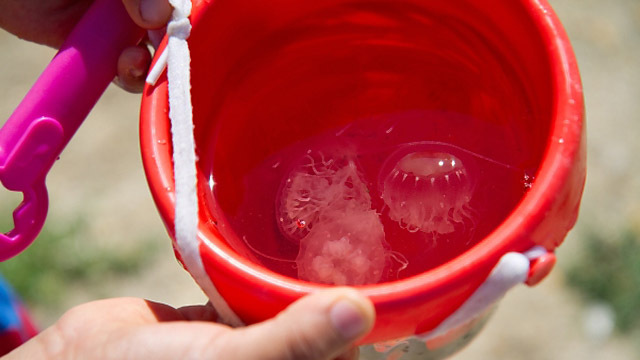 Sea nettles (Chrysaora quinquecirrha), a type of stinging jellyfish, are present in the waters of the Barnegat Bay and other coastal waterways of New Jersey. A global explosion in jellyfish populations is raising alarm in the scientific community around the world. The proliferation has threatened to shut down power plants in Israel and has tripped up commercial fishing operations in Japan. In Barnegat Bay, separated from the Atlantic Ocean by the Barrier Islands of the New Jersey shore, the consequences are a bit more mundane: swelling numbers of stinging sea nettles over the past decade has made swimming on some beaches impossible, and bayside homeowners are complaining that rentals are down. Teams of researchers are mapping the DNA of the small, saucer-shaped sea nettles, and collecting water samples to track the conditions in which they do best. But they are also trying to answer a more basic question: how much populations are actually growing. This summer, researchers with the Barnegat Bay Partnership began screening local beaches with a fifty-foot net four times a week to establish population numbers. In the largest haul, they captured (and threw back) an estimated 1,400 sea nettles in one sweep. “It tells us that things have changed, that something’s out of balance, something is out of whack,” said Jim Vasslides, a scientist with the environmental group. Vasslides said a handful of factors are likely contributing: rising water temperatures means jellyfish in their larveal stage are surviving and thriving over the winters. Changes in water salinity is also likely a factor, as is a lack of predators. 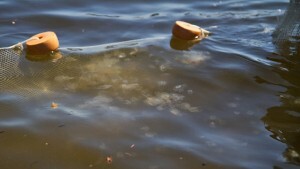 Nitrogen runoff in the densely populated northern areas of the watershed causes low dissolved oxygen levels in the bay and surrounding waterways, which kills off many types of fish but leave jellyfish thriving. Researchers recently captured (and threw back) an estimated 1,400 sea nettles along the shore in one sweep of a 50-foot net. Finally, an increase in man-made structures in the bay, including docks and bulkheads, gives jellyfish polyps an ideal place to attach, overwinter and multiply. Ironically, the jellyfish seem to do better on plastic surfaces that started replacing pressurized wood when concerns were raised about harmful chemicals leeching into the bay. The sea nettles are not just an annoyance, but can alter the balance of the entire bay ecosystem, changing the dissolved oxygen content in the water and affecting microbial communities and more visible species, Vasslides said. “They’ll also eat a lot of the smaller prey…that are food for bigger fish, so they could really wipe out some of these smaller fish populations,” Vasslides said. Vasslides said the group hopes to expand its monitoring efforts to additional beaches next summer. 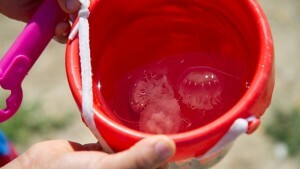 Visit WHYY’s Newsworks for further coverage on how the proliferation of sea nettles are affecting locals. Carolyn Beeler is a health and science reporter at WHYY in Philadelphia. She studied print journalism but caught the radio bug as a Kroc Fellow at NPR. Her work has taken her to the bottom of a bat cave and the middle of a jellyfish-infested bay, and her pieces have aired nationally on Morning Edition, All Things Considered and Weekend Edition. She has worked as a journalist in Chicago, Washington, D.C., Seattle and Cape Town, South Africa. Carolyn studied journalism at Northwestern University.